See how JumpSport designs, engineers, and tests its products for safety, and how JumpSport’s products compare with others on the market. You’ll only buy one trampoline. That’s why we look at over 40 real-world use & abuse tests and other criteria on our products for the safety of your kids . . . and for your peace of mind. Parents: At JumpSport, we prod, measure, stretch, slam into, test, bounce on, and review 40+ criteria to make sure show that we live up to our mission of keeping your family safe. Based on our 20 years of leadership in the industry, and with over 17 patents and pioneering safety innovations, we know that safety is only good if it lasts. 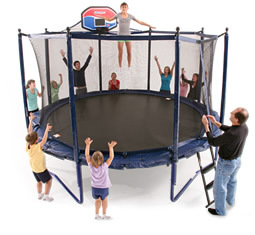 Typical, low-priced trampolines, and even some high-priced modes, quickly become unsafe and actually cost more per year to maintain safe use or to replace compared with JumpSport and AlleyOOP trampolines. BBB helps people find and recommend businesses, brands and charities they can trust. Visit BBB.org to learn more. Getting on and off a trampoline should be simple and easy enough for young children to do themselves. 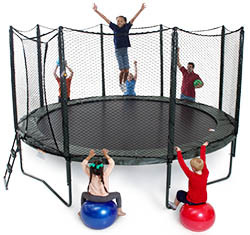 The best entry system we found is the overlapping entry where the netted safety enclosure doubles over itself and jumpers slide between two nets to enter and exit the trampoline and can never be left open accidentally. 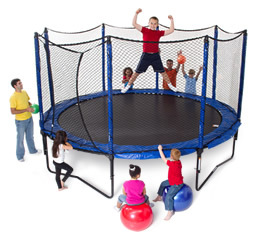 A well designed enclosure puts jumpers safely back to the trampoline bed. With redundant connections at the top, along the poles, and at the bottom of the netting, enclosures stay in place and protect jumpers even if one connection fails. Sturdy padded poles help eliminate injury from accidental impacts. Safe zones are areas where a user can stand comfortably and safely, while waiting for their turn to jump. A safety enclosure should allow jumpers to safely stand on the pad while waiting their turn. High quality nets have thick woven braids that prevent sun damage because the outer strands protect the inner strands from UV rays, resulting in a longer lasting net compared to fine mesh style nets. The AirShock System is designed specifically to help reduce the risk of injury on the mat of the trampoline, where most injuries occur. This safety system is up to 50% more forgiving, puts half the stress on your body, and acts like a giant air pillow, providing you with the safest bounce. The frame is the foundation of your trampoline. A safe frame is built to last and will have a warranty of at least 10 years — the period of time a trampoline is expected to be used most frequently. Springs bring your trampoline to life. They’re a critical element to getting a smooth and safe bounce. Springs absorb the energy from a jump and return that energy in the opposite direction to lift the bouncer into the air. Quality springs typically have a warranty of at least 5 years. The weight and thickness of your padding will contribute to the longevity and protection it gives you. For example, light-weight or low-density pad will compress after a few uses, losing its ability to absorb energy from jumpers. Be sure the padding covers every part of the springs. 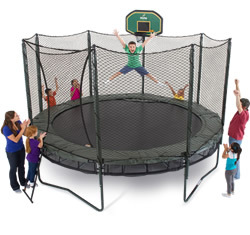 Pads are the most frequently replaced safety feature on a trampoline. Any warranty over a year is indicative of a high quality pad. The inventor of the Trampoline Safety Net that protects millions of happy kids around the world, Mark Publicover, created TrampolineSafety.com to encourage the companies using his many trampoline inventions to build longer lasting safety components. JumpSport, the family owned business founded by Mark in 1997, sponsors and owns this website. We are completely transparent about how we gather over 40 data points and measurements. All testing is conducted by JumpSport using its state-of-the-art equipment and facilities.